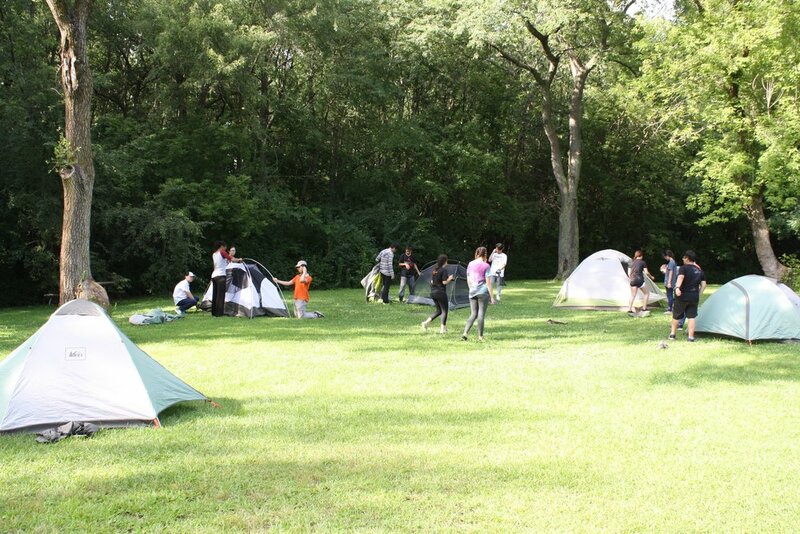 Screen-free, outdoors based, experiential learning summer camp. Our screen-free, co-ed Camp for the Wild is designed with today's youth in mind, age 13+. Emphasis on screen-free. Camp for the Wild is about experiencing our world in the name of curiosity, inspiration and adventure. Our goal is to re-ignite the human nature in our campers through this hands-on, get-dirty, immersive program that educates and activates. Camp for the Wild is composed of two glorious weeks of summatime. The first week is a series of four day-trips, Monday-Thursday, where campers learn necessary and practical outdoor skills that translate to the real-world. By the end of the first week, campers will be prepared to put their new skills to the test in week 2: a four day, all-in backpacking trip in the Shawnee National Forest, complete with a day of service in the wilderness. The lessons to be learned through outdoor exploration are limitless so we've done our best to ensure campers get the most out of their time with us. We'll leverage teamwork via canoe; time management over dinner by campfire; self-confidence by map, compass and a lot of land; and connectivity between us and the planet through education and stewardship opportunities. Week two will be a culmination of all the skills learned in week one with the one exception: Non-stop exploration, immersion and connecting in the throws of the Shawnee Wilderness. While we're in the Shawnee we'll have the opportunity to meet and work alongside US Forest Service Staff on a habitat restoration project. Our counselors are wilderness guides in disguise. Trained in CPR, Wilderness First Aid or better, and a dedication to educate and recreate, our female and male staff are experienced, vetted, trained and then trained some more to ensure our campers have the summer to emulate. Each camp will have a 5 to 1 camper to counselor ratio, ensuring strong guidance and dedicated attention and safety. Every morning we'll meet at Osmium Coffee. Osmium is just over 1 block west of the Brown, Red and Purple lines and accessible by Belmont 72 bus. Coffee is on us for the first day of camp. Week 1: Drop off the campers at Osmium, 6:00 a.m. for 6:15 departure. Pick up the campers at Osmium at 4:00 p.m. Campers must pack a lunch for each day in week 1. We'll hook up the nutritious snacks and bevs! Week 2: Same place, same time - Osmium Coffee, 6:00 a.m. Campers will call home at our fill-up downstate before we begin the journey. We'll be sure to call home once we emerge from the wilderness the following Thursday. Expect us back at Osmium at 5 p.m. that Thursday. Because this is THE Camp for the Wild, we do our best to keep our programs running along in a number of conditions. However safety is our strongest record so in the event of severe weather, we ensure campers will be provided with an enriching Plan B, indoors. Options such as the Field Museum, First Ascent Climbing, Peggy Notebart Nature Museum and the classrooms and bunkers at the Midewin National Tallgrass Prairie are all on our favorites for indoor opportunities. Camp orientation will take place Wednesday, July 25. Due to a larger group (parents and campers) we will meet at the Field House at Hamlin Park, 3035 N Hoyne, Chicago, IL 60618. 6:00 p.m.
WHY CAMP FOR THE WILD? Because parents shouldn't have to drive their kids to Wisconsin for educational, recreational experiences. Because our record in safety, education and fun is proven by our experience with Chicago's youth. Because our programs are designed by backcountry leaders. Because this two week camp is half the cost and twice the value as others that require great travel. Spending time outdoors is now being proven as a leading method to provide unlimited benefits in physical and mental wellness. What we know now is that spending time outside, combined with physical activity greatly increases a child's ability to focus and learn. Immersing ourselves in nature has been proven to lower stress; increase mood and creativity; and provide a sense of well-being and peacefulness. Registration opens March 1st. Register by May15th and receive 15% off. Payment may be made by check. I was fortunate to take part in an Adventures Accessed trip last winter. Aaron was an outstanding guide-- leading us to unique destinations that served to reconnect each and every one of us with nature. His enthusiasm for all things natural was contagious. I returned from our trip craving another opportunity to get outside. Saying this during winter in Illinois was no minor accomplishment! Through Adventures Accessed, many of our youth have been provided very new and enlightening opportunities to develop skills and explore new interests. They have been able to canoe, hike, build a fire out of found materials, visit a farm, learn about sustainable farming, and more. These activities have presented challenges for the youth that they have been able to take on with the support of Adventures Accessed and Lawrence Hall staff. The trips have challenged our youth to think creatively, work collaboratively alongside peers and adults, and consider our impact on the environment around us, all skills that translate to their daily lives. We look forward to working with Adventures Accessed in the future and connecting more of our youth to the services it provides. Taking young men out into the wilderness for several days was the ultimate group mission. We were tested physically, intellectually, emotionally, and spiritually. It captured the essence of everything we teach in the B.A.M. program. Booya! It's going to be a wild summer.